Fue hair transplant clinic Lahore is consistently producing excellent results for the last eighteen years. Previously our hair restoration clinic in Lahore produced best results in FUT procedure.Denser hair is the dream of every person, who is bald or in process to be bald. You may have healthy and voluminous hair as if you were never bald. What you need, is just to transplant hair from Dr.Ahmad Chaudhry as Fue hair transplant clinic in Lahore assure you for natural and denser frontal hairline. What is FUE hair transplant technique? Hair transplantation is a modern way to grow hair naturally. Through hair restoration donor area healthy grafts or follicles are transferred into hair loss or bald area called recipient zone . Hair transplantation can not only for head; but also be used to restore eyelashes, eyebrows and beard. Donor hair can be harvested by using a technique called FUE. The surgeon, first, analyzes the patient’s scalp and then recommends FUE treatment. FUE is an acronym that stands for Follicular Unit Extraction. In FUE, follicles are extracted directly from donor area like scalp, containing one to four hair; this micro removal uses tiny punches in between from 0.6 mm to 1.0 mm in a diameter, which completely heals within 10 days and leaves no marks on donor’s skin. For such extraction of follicular units, the scalps need to be shampooed and proper antiseptic should be in place. The extraction process keeps going on until required number of follicular units sufficient to harvest. The surgeon, then, uses sharp micro blades or fine needles to make the recipient site. Now the most awaited moment arrives, the surgeon places the harvested follicular units into bald or hair loss area where healthy hair will start growth after three months. There should be no stitches in such transformation. FUE has been practicing for past many years by surgeons for permanent and scar-less restoration of hair. FUE is so effectual surgical method that its results are incredible and no one can judge whether they are transplanted hair or natural. FUE is the only hair regrowth treatment that can be repeated after a period of one month. FUE is a simple technique for hair restoration followed by a local anesthesia that typically lasts up to six hours. It might be done in single session or multiple sessions. Single session, generally, involves one day; whilst multiple sessions require two consecutive days of surgery and recovers within three to five days. Since there are no stitches and wounds, thus, tiny scabs can be covered under hair. FUE hair transplant clinic Lahore will provide you written instructions things to avoid before procedure. Follicular unit extraction is the less invasive technique that demands a lot of concentration and expertise. It is, therefore, a time consuming process. Proper extraction of a follicular unit is paramount to ensure the viability of the transplanted hair. The patient should refrain from using any medicine, several days prior to surgery, which might result in bleeding while the treatment. In addition, it might ruin the desired result. Alcohol and smoking may restrict the ultimate benefit of hair restoration surgery. Besides the benefits of FUE procedure, the reasonable costs of surgery may attract more patients to pursue the procedure. The world of technology grooms day by day, and providing new ways to improve oneself. Hair is adding up an influential impact on the personality. Say good bye to baldness and say yes to hair Restoration. Ace the every aspect of your life and live it more confidently. 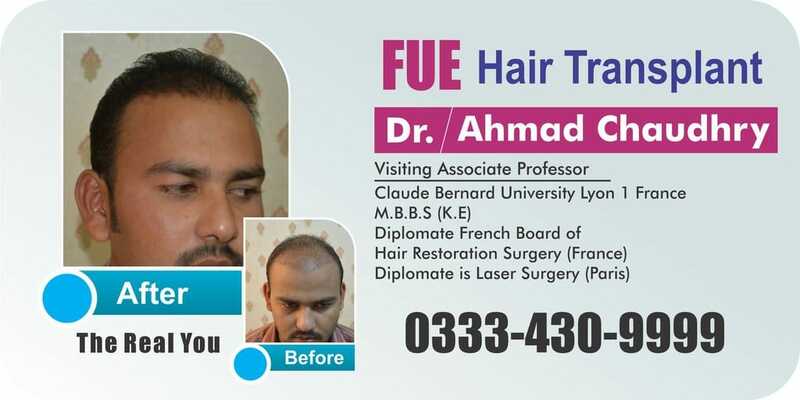 Fue hair transplant clinic Lahore displayed many patients reviews and testimonials so that while selecting for hair loss or baldness procedure, one should always look for previously treated patient’s reviews, testimonials as well as before and after photos. We should not trust blindly and have to search clinic repute, results and expertise of the surgeon online. It is strongly recommended to meet physically one or two patients where you have decided to get your procedure. This important step of screening will save you bad hair transplant results. Body Hair to head is Possible in Pakistan? Dr.Ahmad Chaudhry is performing Body hair to head in Pakistan successfully for the last many years. BHT should not be a fist priority rather it should be last resort to restore scalp hair. There is little bit more transection ( wastage) rate when we extract grafts from chest, abdomen ,beard or other parts of the body. However body hairs are last hope for those patients who do not have enough donor area. This lack of donor area could be a result of multiple previous strip procedures, as a result wider scars in the donor area. Sometimes these body hair may adopt the characteristic of the scalp hair and texture. Body hairs can also be used to repair the previous unnatural look or bad results. It is a last attempt to correct or add more density and extraction from chest, abdomen or back and put to head. If you are interested to get body hair to head then Fue hair transplant clinic Lahore would definitely help you to restore your head glory. How to regrow hair after trichotillomania? © All Rights Reserved. 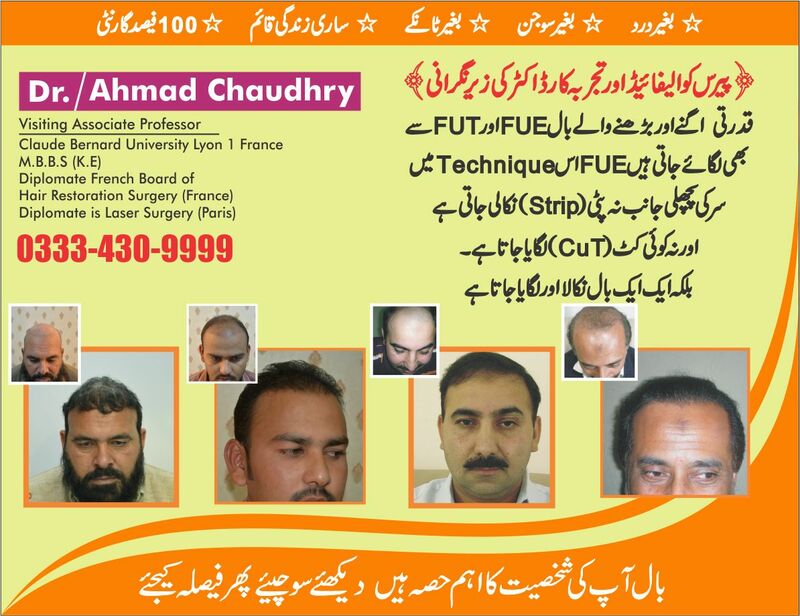 Dr.Ahmad Hair Transplant Pakistan.